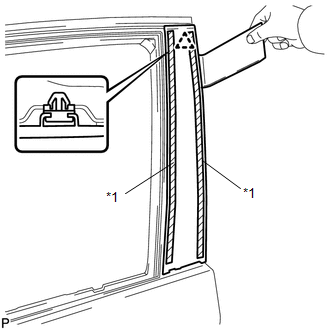 (a) Using a clip remover, disengage the 2 clips and remove the upper part of the front door weatherstrip to the extent that allows removal of the front door window frame moulding. When removing the front door rear window frame moulding, heat the vehicle body and front door rear window frame moulding using a heat light. 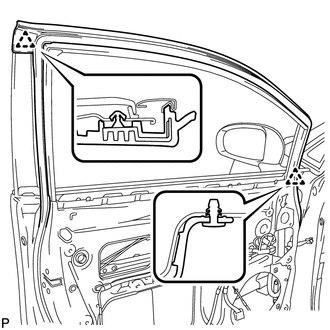 Do not heat the vehicle body or moulding excessively. 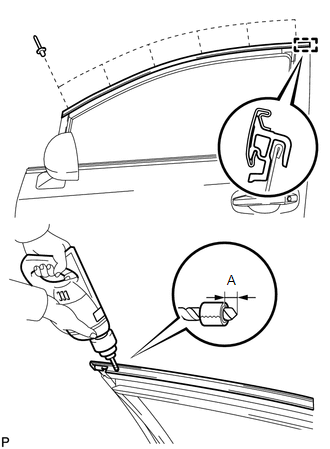 (a) Using a heat light, heat the front door rear window frame moulding. (b) Using a moulding remover, remove the clip and front door rear window frame moulding. 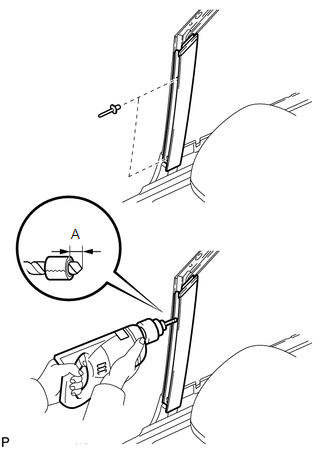 (b) Remove the bolt <A> and disengage the front door check assembly. 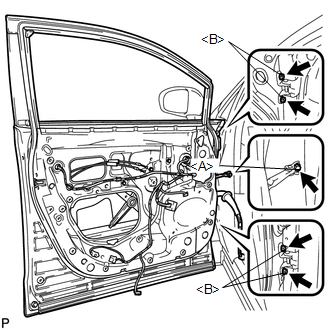 (c) Remove the 4 bolts <B> and front door panel sub-assembly. To prevent damage, when removing the front door panel sub-assembly, make sure that there are enough people available to hold it securely. (a) Insert a 4.0 mm (0.157 in.) drill bit into a drill. (b) Tape the 4.0 mm (0.157 in.) drill bit 5.0 mm (0.197 in.) from the tip as shown in the illustration. Tape the 4.0 mm (0.157 in.) drill bit to prevent the drill bit from going too deep. (c) Lightly press the drill against the rivets to drill off the rivet flanges, and remove the 6 rivets. Pressing the drill too firmly will cause the rivet to turn and result in the rivet not being drilled through. Prying the rivets with the drill may damage the rivet installation holes or drill bit. Be careful of the drilled rivets, as they may be hot. (d) Using a vacuum cleaner, remove the rivet fragments and shavings from the drilled areas. (e) Disengage the guide and remove the front door upper window frame moulding from the door frame. (c) Lightly press the drill against the rivets to drill off the rivet flanges, and remove the 2 rivets. (e) Disengage the guide and remove the front door front window frame moulding from the door frame.